"I can hardly wait to see what Pat is like," Trixie said. "He's so attached to his horses, he probably looks like one - buck teeth, bulging brown eyes, and one lock of hair hanging down over his forehead." Minutes later, the girls heard the sound of heavy boots on the porch. The door opened and Regan stepped inside, followed by Bill Murrow, who guided his guest down the hall to show him where to wash up. The last person inside was a tall, slender teenager, too muscular to be called thin. He had high cheekbones and a long, straight nose. He did, indeed, have large brown eyes and a lock of brown hair that strayed across his forehead, but the effect was far from horselike. "Pat, this is Trixie Belden," Mrs. Murrow said. Pat's answer was just a nod. "And this is Matt Wheeler's daughter, Honey," Mrs. Murrow concluded. Honey stepped forward and held out her hand. Pat stared at her, but no immediate attempt to take her hand. After an awkward pause, Honey dropped her hand - just as Pat offered his. Realizing he was too late, Pat dropped his - just as Honey raised hers. Honey shrugged helplessly and giggled. Pat turned and and headed down the hall to the bathroom. Trixie turned to Honey and discovered that her usually poised friend was blushing! The incident was pushed aside, however, as Mrs. Murrow assigned everyone to a place at the table and began serving heaping platters of food. None of the young people talked much during dinner. They didn't have to, since Regan and the Murrows kept up a running discussion of horses - their selection, breeding, training, and showing. Trixie listened to the conversation, but she also kept an eye on Honey and Pat. Her friend was pretending to listen intently, but Trixie saw her sneaking frequent looks at the Murrows' son. Pat seemed to concentrate only on his plate. 7. The Deal Is Off! 14. Was It - or Wasn't It? Trixie, Honey and Regan travel to Minnesota to visit a family who train horses in the hope of learning some techniques to adopt with their horses. The legend and a sighting of a galloping ghost has Trixie on the trail of a mystery and she is joined by a ghost hunter, while Honey is distracted by the handsome young horse trainer, Pat Murrow. The Murrow's farm is threatened by a local developer who takes matters into his own hands when they won't sell. 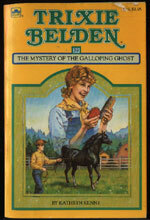 Their prize stallion disappears and the search is on to find the horse and solve the mystery of the galloping ghost. Jon Burke was desperate to buy the Murrow's land and stole their prize horse in a last attempt to make them sell. Honey and Trixie are the only Bob-Whites to appear in this book. Jim, Brian and Mart were at home working around Crabapple Farm as they would be working as camp counselors later that summer (p. 14). Di and Dan had other summer plans that aren't mentioned (p. 15). Apparently, Miss Trask had been hired as a full time manager of Manor House (p. 14) - no mention of her ever being Honey's governess. "You seem to have found plenty of excitement already," Trixie retorted. "I-I don't know what you mean," Honey said, carefully avoiding Trixie's gaze. "Sure you do," Trixie told her. Honey let her feelings burst forward with a sigh. "Oh, Trixie, don't you think Pat Murrow is just about the cutest boy you've ever seen?" "No, I don't," Trixie said. "That's probably just as well, since you obviously do think so." "What?" Honey sounded shocked. "You don't think he's cute? Those beautiful eyes, those sensitive hands..."
"I didn't say he isn't cute," Trixie corrected her. "He's just not the cutest boy I've ever seen. I hadn't noticed his hands, though," she added with a smile. "I'll have to take a closer look." He gave Honey a big smile that showed even, white teeth and made a dimple appear in his right cheek. "All right, all right," Trixie replied. "I won't make any trouble." As long as Honey likes Pat Murrow so much, I'll try to like him, too, she told herself (p. 59). However, on this occasion, Pat doesn't turn out to be a villain and Trixie's opinion of Pat changes.